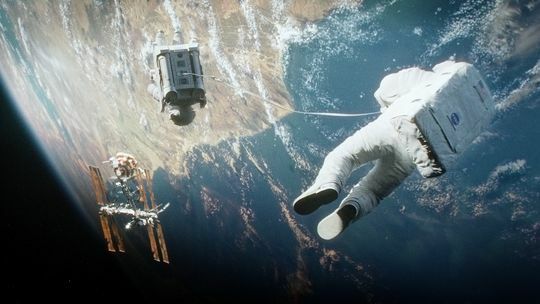 Gravity is an extraordinary film. From start to finish barely a quibble is to be found in narrative or execution. No doubt from its story, its imagery and with its referential subtleties, this film is Oscar bound for its star and its makers. A well grounded movie that soars above most. Alfonso Cuarón gives us a remarkable product. Often when the writer is the director and is the producer, the checks and balances go awry and the final cut lacks discipline (that arrogant curse of the multi-hyphenate). Not the case here. Highlighting the actors, the story, the visuals and the editing (including well publicized tracking shots) Cuarón gives us a straightforward film, multi leveled, nuanced, and complete. Like in his previous films, “Y Tu Mamá También,” “Children of Men,” and even “The Prisoner of Azkaban,” character is intense, sometimes more intense than action. Credit the actors – substantially – but Cuarón clearly has the skill to elicit such acting. With almost little interaction, the chemistry between Dr. Ryan Stone (Sandra Bullock) and Comdr. Matt Kowalski (George Clooney) is intense — regardless of the color of their eyes. The writer’s resources to keep the action going are used impeccably. The use of 3D is effective. The ending… indescribable without a massive spoiler. Everything that makes a great movie.